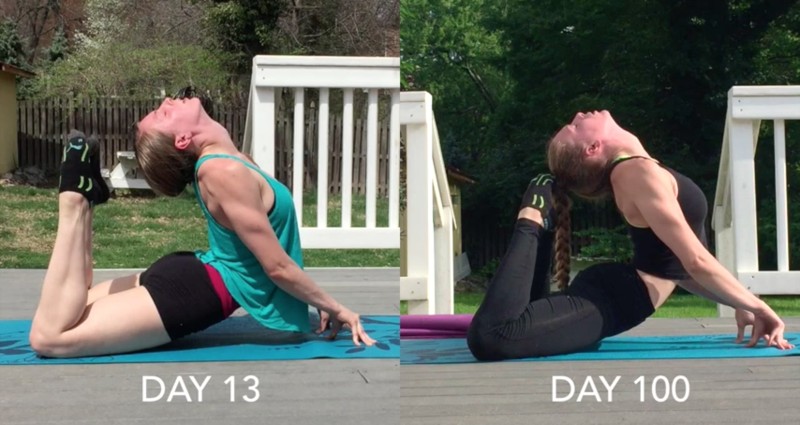 I stretched 4 days a week, 2 hours per session; totaling over 100 hours of stretching in 100 days. 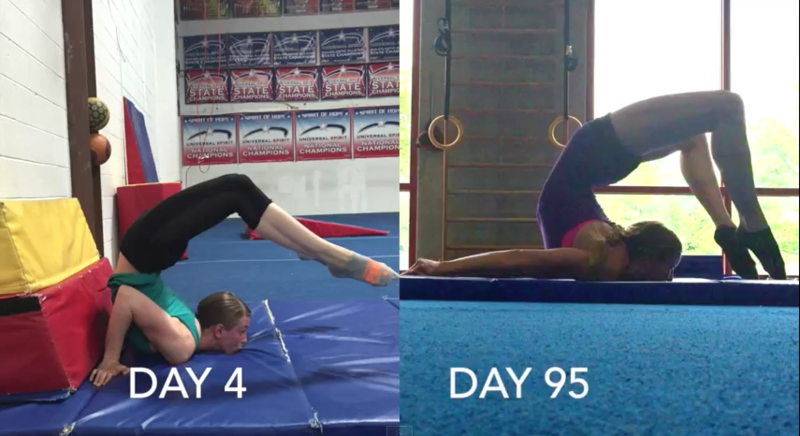 This is my second completed 100 day contortion challenge! The main goal I reached was a better understanding of my body and how to use it. 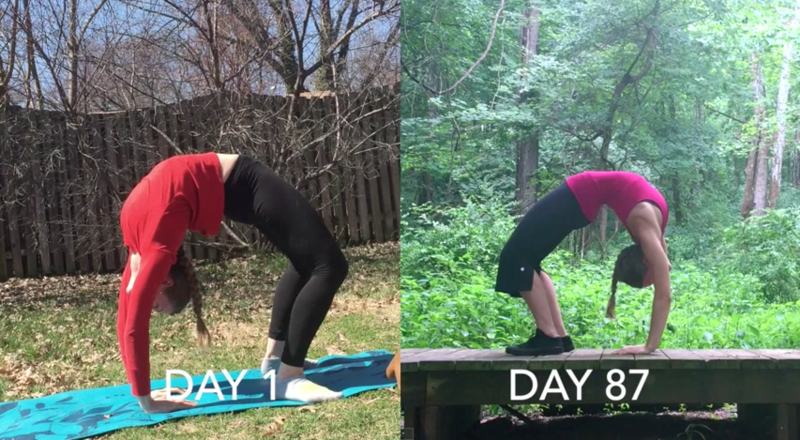 I have compiled a new list of tips to further complete my list from last years’ 100 day contortion challenge. I cannot stress enough how important it has been for me to have a consistent warmup and dynamic stretching routine. 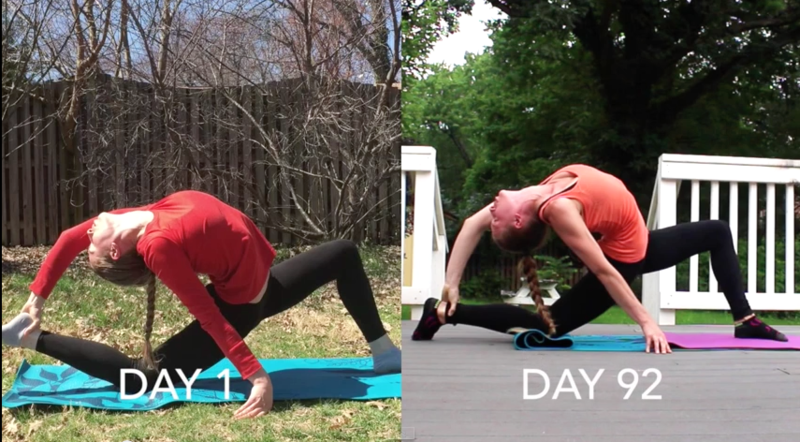 Dynamic stretching alone will increase your flexibility and strength way more than if you were to just sit in splits. I start with 1 minute of cardio while moving my joints in large ranges of motion, then I move onto the dynamic stretches. The dynamic stretches not only increase flexibility, they also strengthen; which is equally as important. It’s the same routine every time, that way I build habits. I also watch myself on video to make sure my posture is correct. If my posture is off, I have to find the muscle that is lacking in strength and make a habit to always correct my posture, through muscle understanding. I remember when I first started stretching and I would do the standard gym class warmup and then hop right into splits. A couple toe touches, grabbing the leg behind you, some neck rolls, and bringing the arm across the chest. Real basic stuff, however that habit stuck with me until I was 20. 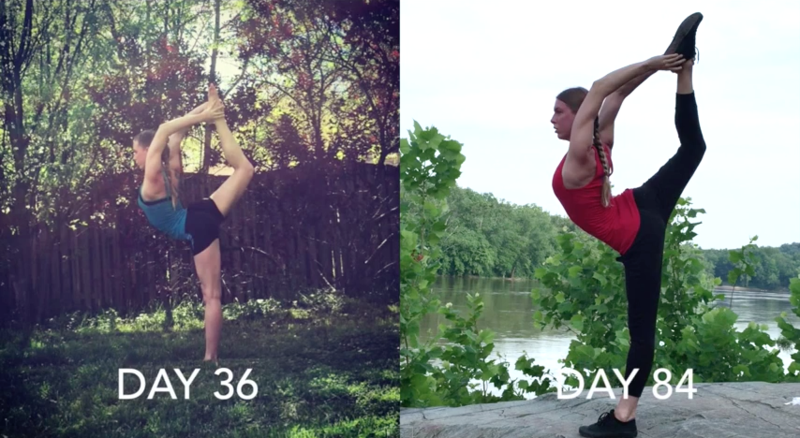 So about 15 years of improper stretching and warming up, no wonder I wasn’t flexible. It takes time for our muscles to warm up and loosen. The best way to achieve your maximum flexibility is to warmup for at least 20-30 minutes. In yoga they say breath brings you strength, and the more connected you are to your breath, the more aware you become of your body. 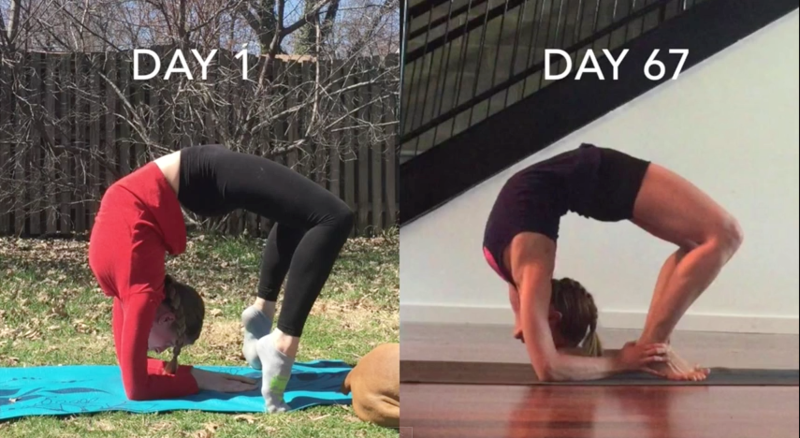 With this basic concept I began to focus on breath the whole way through my routine. With each breath my body began to lengthen, expand, and muscles began to relax. Without reading or knowing why this was good, I began to realize that I could stretch further, and with less pain or resistance when I breathed deeply and consciously. Which also meant that I could stretch further and with less pain when I lengthened, expanded and relaxed my body. Even though I understand these basic concepts, implementing them has been the journey. All it takes is time, after 100 hours of focused breathing you’re bound to learn a thing or two about your body. 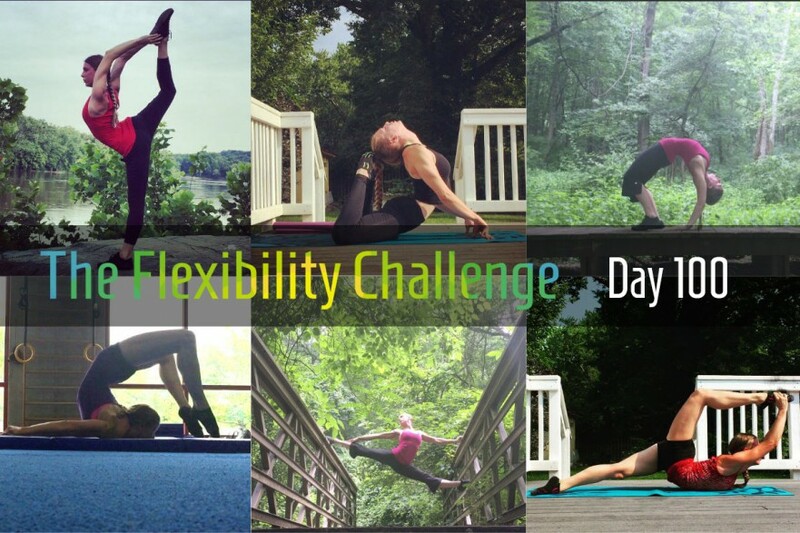 By setting my schedule in my profile on the flexibility challenge, and adding it to my calendar, I felt more accountable. I am a very schedule oriented person, because if it’s not on the schedule it probably won’t happen. I wasn’t always a scheduled person, but then I realized I wasn’t being as productive as I could be, so I had to learn to be a scheduled person. Once I conquered that, I was able to follow through on my stretching schedule. The more I stuck to the schedule, the more habitual my routine became, the more I craved my routine. I also started making the experience as enjoyable as possible by taking notes on what I enjoyed most. I can tell you my perfect stretching experience, where I will be most productive. Morning routine is complete; i.e. showered, fed dog, responded to emails, etc. 70 degree weather in the early morning around 7-9am. On my deck with 2 yoga mats and a towel. Tea and water to sip on. Chico dog bathing in the morning sun beside me. Although I’m scheduled, I also make room in the schedule to fit my present needs. Sometimes I don’t feel like stretching, so I don’t, sometimes it’s raining and I just want to read inside instead. Some days I don’t want to do a deep stretch, I’d rather just do dynamic stretching in nature while walking chico dog. I never beat myself up for being tired or just wanting a break. Being gentle with yourself is important. However, even on my rest and repair days I am constantly fixing my posture and doing light stretches around the house. I feel my best when I keep my body moving throughout the day. When I’m not stretching I’m sitting at my desk working at my computer for long hours, it can take a toll on my body if I don’t move around and stretch every once in a while. Food from the farmers is my number one go to when it comes to repairing. I make sure to eat as many fruits, veggies, nuts, seeds, herbs spices, etc to repair. Real food has real building blocks, that keep you healthy, “fake” processed is just a fraud and will leave you feeling even more depleted afterwards. I go for the real stuff because it makes me feel real good! Real food doesn’t have an ingredient list, real food is an ingredient. Check out my pure food recipes for inspiration! For all you naturals, consider yourself lucky that you have the muscle memory to do this without having to think about all of that! 2 things that helped me with touching my feet to my head. The weights really help you to sink further, as long as you can breath and relax your hamstring, quads, and hip flexors. You really have to consciously let go of tension, and stress in the muscles. I do this by engaging my muscles on the inhale, to be fully aware of their tightness, and then fully relax on the exhale as I go deeper into the stretch. I have tried this technique with many of my students and it has helped them all tremendously. 2 things that helped me with over splits. 1. Moving my legs in all ranges of motions. i.e. I would switch from left split, to middle split, to right split and back. 2. 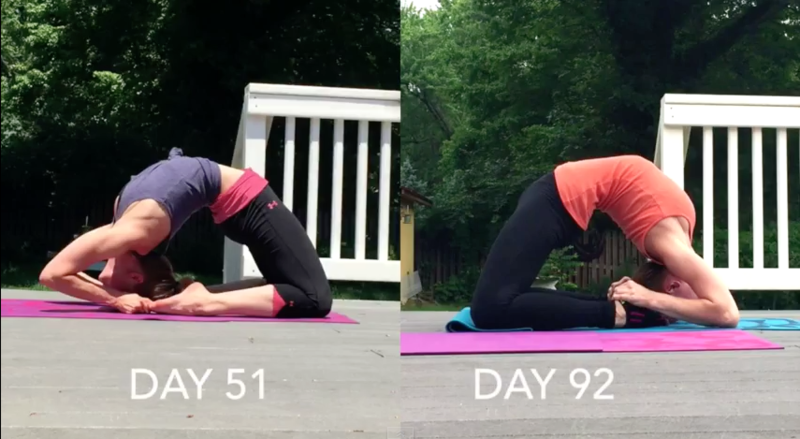 Dynamic lower body stretches from The Flexibility Challenge. I am always amazed at how much body awareness is needed to make steady progress. You have to be able to individually control each muscle, wether you are engaging, relaxing or lengthening; each muscle has a purpose. Once you have conquered good form in poses, it’s all about building muscle memory and making the poses more effortless. Close but not yet what I had envisioned. In this challenge I learned the difference between a middle split and a straddle. Last year I had been working on the straddle, with knees facing upwards. 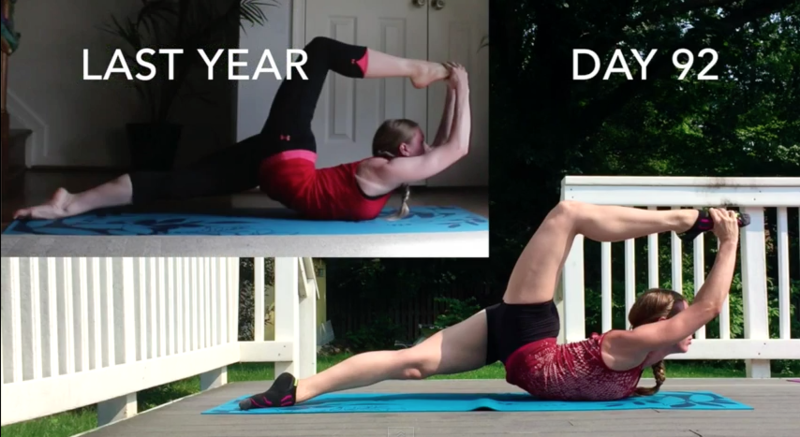 This year I focused on middle split, with knees facing forward. 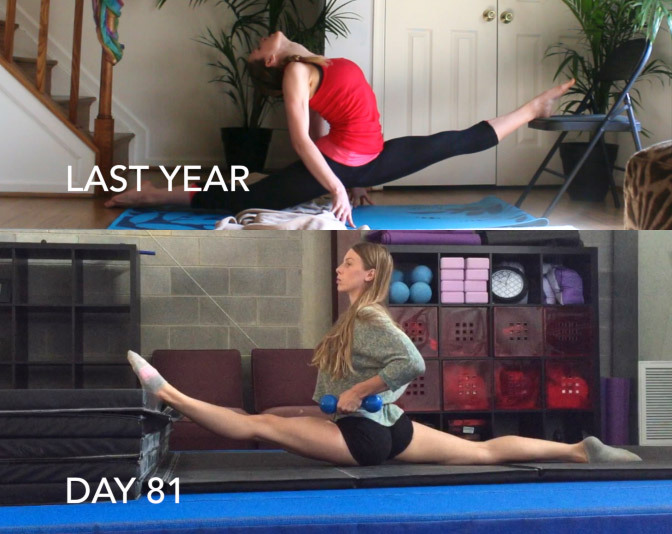 This is the most painful stretch for me, but I am so close!! A hairpin is when you grab the back of your ankles. Obviously I am a long ways away but my bridge is making progress slowly but surely. I probably should have listed sub goals, but I’m trying to keep this as simple as possible. A needle is basically a contortion version of a scorpion in yoga. The needle is when your back leg is straight. I need to continue walking my arms down my leg, to pull it straight. I’ll need to develop more strength to hold this flexibility. Specifically I can feel my upper back muscles are straining to keep up. I had wanted to touch my feet flat on the ground with my legs straight and no assistance. I still have a ways to go. My neck and upper back flexibility are holding me back. However my back is getting stronger and stronger, and the fact that I can touch my feet to the ground with no assistance is big progress. I sustained no injuries, only a few moments of uncomfortableness due to imbalanced stretching. Thankfully I was aware and corrected myself. I append this to listening to my body, when I was tired, I rested. When one area was sore, I focused on another area to avoid overuse. There is no magic routine that will help you avoid injury, it’s your ability to listen and be aware of your body. 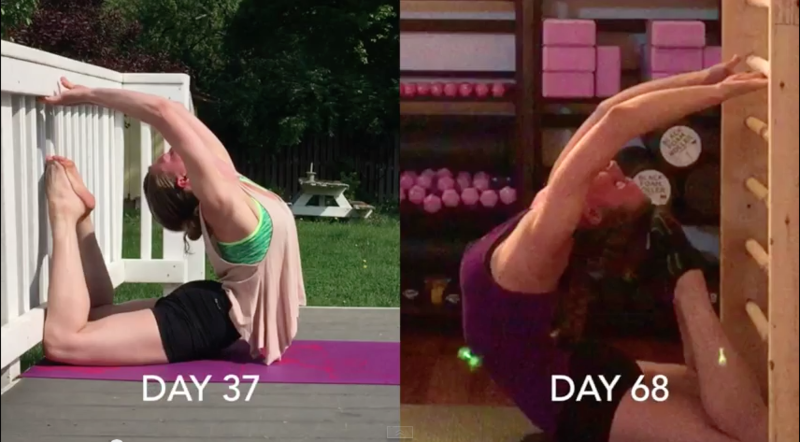 The poses that supplemented my goals. 100 days seems so long yet it goes by so fast! Although the 100 days is over, the journey never ends. Yeah this was my second year so I already had some good regular flexibility built up, but I really gained strength and muscle control in my new flexibility so I could do these poses on the pole without risking injury.